In vast regions of the oligotrophic tropical and sub-tropical open oceans, input of new nitrogen is primarily dependent on the N2-fixing capabilities of diazotrophic cyanobacteria, including unicellular cyanobacteria such as UCYN-A (Martinez-Perez et al., 2016) and filamentous cyanobacteria such as Trichodesmium spp. (Carpenter and Capone, 1992; Capone et al., 1997; Campbell et al., 2005). Trichodesmium spp. are a fundamentally important organism as they represent up to 50% of new nitrogen in some regions (Karl et al., 1997; Capone et al., 2005), and contribute between 80 and 110 Tg of fixed N2 to the open ocean ecosystems per year (Capone et al., 1997). Diazotrophy is performed by the two-component enzyme nitrogenase, which comprises of an iron-molybdenum protein (dinitrogen reductase) and an iron protein (nitrogenase reductase). The former reduces the latter using a low-potential electron donor (ferredoxin) and consumes two molecules of ATP per electron. Nitrogenase contains 19 iron atoms per heterodimeric protein molecule (Shi et al., 2007). This is important because iron is a cofactor for a whole range of enzymes involved in photosynthetic and respiratory electron transport, nitrate and nitrite reduction, chlorophyll synthesis and other biosynthetic or degradative reactions (Geider and La Roche, 1994). Trichodesmium's dependence on diazotrophy means the genus has a relatively high metalloenzyme inventory. As a result, iron availability may be critical in controlling rates of nitrogen fixation in large areas of the open ocean (Rueter, 1988; Rueter et al., 1992; Falkowski and Raven, 1997; Wu et al., 2000). The majority of Fe(III) in the open ocean is chelated by organic compounds (Shi et al., 2010) with the remaining fraction present as hydrolysed species [Fe(OH)x(3-x)+]. The neutral tri-hydrolysed species [Fe(OH)3] has very low solubility. As ocean pH decreases, so too does the hydroxide concentration, which slightly increases the solubility of iron in seawater (Liu and Millero, 1999). As hydroxide ions and organic chelators compete for the binding of Fe(III), ocean acidification will alter the organic chelation of iron, the degree of which is subject to the pKa of the binding site (Shi et al., 2007). This may therefore act to limit the bioavailability of iron. This is particularly important for areas of the ocean where a significant fraction of new iron comes from dissolved iron in deep waters. In areas where the major source is particulate iron, this may be partially compensated for by an increased ability of some chelators to dissolve iron from oxyhydroxides, arial dust, and siderophores (Shi et al., 2007; Rubin et al., 2011), and/or by enhanced photo-induced redox cycling (Croot and Heller, 2012). The exceedingly low solubility of ferric iron (Fe3+) (10−18 M at pH 7.0 and effectively insoluble at higher pH), coupled with the fact that a major source of iron flux to the open ocean gyres is from atmospheric dust deposition (Gao et al., 2001) has led cyanobacteria to employ various mechanisms to (i), increase iron acquisition from the environment (i.e., outer membrane receptor proteins, ligand complexes, periplasmic and cytoplasmic iron transport proteins) (Braun and Killmann, 1999) (ii), decrease the cellular iron requirement by regulating the expression of genes encoding for cellular iron homeostasis (i.e., IsiA, IsiB, Fur) (Webb et al., 2001) and (iii), intracellular recycling of iron (Saito et al., 2011). These mechanisms allow increased production of high-affinity iron transporters and down-regulation of membrane-bound photosynthetic electron transport (PET) components in proportion to their iron requirement (Ivanov et al., 2000). For example, the Cu-containing plastocyanin in place of cytochrome c553 and flavodoxin in place of ferredoxin (Geider and La Roche, 1994). There is still a dearth of knowledge regarding Trichodesmium's growth and photo-physiological response to iron-limitation; especially in combination with the effects of ocean acidification (Berman-Frank et al., 2001, 2007; Shi et al., 2007, 2010). Given the significant role that Trichodesmium plays in biogeochemical cycles, it would be extremely useful for future climate models if such responses were better understood. Recent studies have considered integrated responses of CO2 and light (Kranz et al., 2010a), CO2 and iron (Shi et al., 2012), CO2 and NO3- (Eichner et al., 2014), and CO2, temperature and light (Boatman et al., 2017). These studies illustrate how Trichodesmium's productivity and growth is modulated by numerous environmental factors, highlighting the need for more systematic, multivariable experiments under co-limiting conditions. This requires that fully-acclimated balanced growth is established by culturing Trichodesmium for long time periods, under controlled and defined conditions. Like the majority of experiments investigating physiological effects of iron-limitation, most research involving Trichodesmium has used a single independent variable (e.g., iron) whilst keeping CO2 and light intensity constant (Berman-Frank et al., 2001, 2007; Chappell and Webb, 2010). Most of these studies incorporate 5–8 treatments and culturing periods that may not have been long enough to establish balanced growth. In addition, growth conditions were frequently undefined. Notable exceptions were the studies by Shi et al. (2012), who investigated iron-limitation at three CO2 concentrations at constant light intensity and temperature, and Hong et al. (2017), who investigated two CO2 concentrations at constant light intensity and temperature. Our approach comprised a systematic, multivariable experiment; where numerous T. erythraeum IMS101 treatments were grown over long durations with controlled and well-defined growth conditions. Our aim was to assess the response of T. erythraeum IMS101 growth, relative photosystem II (PSII) electron transport rates and photo-physiology to free iron (Fe′), and investigate how the integrated effect of CO2 and light intensity influence this response. Prior to the experiment, T. erythraeum IMS101 was maintained in the exponential growth phase in semi-continuous cultures at two light intensities (40 and 400 μmol photons m−2 s−1) on a 12:12 light:dark cycle at three targeted CO2 concentrations (180, 380, and 720 μatm) and optimal growth temperature (26°C ± 0.2) for a period of ~10 months. Each culture was used to inoculate T. erythraeum IMS101 across a range (20–13,000 pM) of Fe′ concentrations (4 treatments at LL and 5 treatments at HL), generating 27 experimental treatments in total. All 27 treatments were maintained in exponential growth phase in semi-continuous cultures at the specific growth conditions (i.e., light intensity, temperature, CO2 and Fe′) for ~6 months (~14 generations for the slowest growing cultures and 95 generations for the faster growing cultures) to ensure fully acclimated balanced growth was achieved. Cultures were grown at low volume (5 mL) in 12 mL polypropylene (PP) screw cap test tubes, incubated in a custom-made, water-jacketed aluminium temperature block illuminated from below. Sampling methodology and analytical techniques followed those described in Boatman et al. (2017); and involved median growth rates being determined from a minimum of three replicate growth curves. Experimental setup was slightly different as we employed trace metal-clean culturing techniques and used a modified YBCII growth medium, polypropylene growth tubes, and a modified approach to target a CO2 concentration as described below. Growth rates were quantified from the linear regression of the slope of ln minimum fluorescence (Fo) measured daily (between 09:00 to 10:30) on dark-acclimated cultures (20 min) using a FRRfII FastAct Fluorometer system (Chelsea Technologies Group Ltd, UK). Cultures were kept within the early part of the exponential growth phase and optically thin to avoid nutrient limitation and self-shading as well as to minimise CO2 drift, as described in Boatman et al. (2017). Single batches (4 L each) of filter-sterilised (0.25 μm pore) YBCII media (Chen et al., 1996) were made at each total iron (FeT) concentration (i.e., 400, 200, 100, 40, 4 nM) in acid washed plastic containers. Hydrated and anhydrous salts were added with Milli-Q water (Millipore Milli-Q Biocel, ZMQS60FOI) and the pH adjusted to ~8.2 using filter-sterilised NaOH (pH checked by taking 5 mL aliquots). Trace metal contaminants were removed by filtering through a Chelex column setup within a trace metal-clean laminar flow cabinet (Class II). Trace metals and f/2 vitamins were added to each 4 L container using a revised EDTA concentration (20 μM) (Shi et al., 2012). Varying amounts of a 40 μM Fe stock (FeCl3:Na2EDTA) were added to give the range of FeT concentrations. Each container was filter-sterilised (0.2 μm pore) into 1 L (sterile) plastic stericups (no headspace) (Fisher Scientific 10518822, UK), and stored within double zip-locked polyethylene (PE) bags. Prior to use, growth tubes were acid washed (2 weeks in 10% HCl), rinsed with Milli-Q water (Millipore Milli-Q Biocel, ZMQS60FOI), microwave sterilised, air dried in a laminar flow cabinet (Class II), and stored within double zip-locked PE bags (Anderson and Morel, 1982). Each dilution was made into a new tube to avoid the build-up of contaminants. where Fe(III)′ is the free iron (Fe′) concentration (M); Fe(EDTA) is the total iron (FeT) concentration (M); [EDTA*] is the total EDTA concentration (M); Kd′ (dark) is the constant in the dark (= kd/kf), which is the ratio of the rate constants for the disassociation and formation of Fe(EDTA) chelates; Khv is the rate constant (= khv/kf) for Fe(EDTA) photolysis at a specific light intensity; Ehv is the light intensity (μmol photons m−2 s−1) relative to that at which Khv was measured (i.e., 500 μmol photons m−2 s−1); LP is the light period of the culture treatment (h−1), and pH was a post-culturing measurement on the NBS scale. The inorganic carbon chemistry (Ci) of each media bottle was determined from a 15 mL sample for total dissolved inorganic carbon (TIC) analysis (Shimadzu TOC-V Analyser & ASI-V Autosampler), and a 10 mL sample for pH (Thermo Scientific Orion Ross Ultra pH Electrode EW-05718-75, UK). All carbon chemistry calculations were made in CO2SYS (Lewis and Wallace, 1998), using the 1st and 2nd equilibrium constants (K1 and K2) for carbonic acid (Millero, 2010), the dissociation constant for KSO4 (Dickson, 1990), the boric acid constant (KB) (Lee et al., 2010), and the total pH scale. The pH probes were rinsed and calibrated with fresh (<2 weeks) artificial seawater buffers (TRIS and AMP) prior to use (Dickson, 1993). Once a culture reached a pre-determined Fo, it was diluted (0.5 mL culture to 4.5 mL media) with filter-sterilised (0.2 μm pore) YBCII media to return the culture to a starting Fo value. To obtain a target CO2 concentration in the YBCII media, medium was bubbled with a CO2-air mixture (BOC Industrial Gases, UK) using an acid washed (10% HCl), microwave sterilised section of PTFE tubing. A series of 5 ml aliquots were taken to measure the pH (precision ± 0.002) until the target pH (and thus the target CO2) had been achieved. Once at the target CO2 concentration (±1%), the medium was immediately distributed into the test tubes, already containing the 0.5 mL of culture. The gaseous headspace was flushed with a filtered (0.2 μm pore) standard gas mixture at the target CO2 concentration (BOC Industrial Gases, UK) and the screw caps tightened. Parafilm was wrapped around the caps before the tubes were removed from the laminar flow cabinet. Prior to every dilution, a 2 mL sample of culture and a 2 mL sample of filtrate were collected within 5 mL plastic cryogenic vials (Sigma-Aldrich V5257-250EA). Filtrate was used to measure the post-culturing pH. Assuming a constant alkalinity throughout the entire growth phase (Kranz et al., 2010b), the post-culturing CO2 was calculated from the post-culturing pH and initial alkalinity. The second 2 mL aliquot of culture was pipetted into a new growth tube to run a fluorescence light curve (FLC). Triplicate FLCs were performed for each treatment using an FRRfII FastAct Fluorometer system (Chelsea Technologies Group Ltd, UK) on dark-acclimated cultures (20 min). The FLCs lasted ~1 h and consisted of 12 light steps ranging between 6 and 1,400 μmol photons m−2 s−1, each lasting 5 min in duration. where Fm′ is the maximum fluorescence in the light-acclimated state and F′ is the steady-state fluorescence at any point. where Fm is the maximum fluorescence in the dark-acclimated state, Fv (= Fm − Fo) is the variable fluorescence in the dark-acclimated state and Fv/Fm* is the assumed Fv/Fm from functional PSII. In this study, the value of Fv/Fm* was set to the highest measured value from all treatments under iron-replete conditions. This method assumes that across environmental gradients, all photosynthetically active PSII operate with the same intrinsic photochemical efficiency in the dark-acclimated state. The impact of free phycobilisome complexes within the cell is assumed negligible, as their peak emission wavelengths are too short for detection by the FRRfII. When applicable (i.e., Fv/Fm < Fv/Fm*), Fb was subtracted from F′ and Fm′, and Fq′/Fm′ recalculated. where Fq′/Fm′ is the operating efficiency of PSII (baseline corrected if required) and E is the actinic light intensity (μmol photons m−2 s−1). Additional growth rate and FLC data points were incorporated from the temperature and light response curves reported in Boatman et al. (2017). These experiments shared identical growth light intensities (low light = 40 μmol photons m−2 s−1, high light = 400 μmol photons m−2 s−1), light:dark cycle (12:12), CO2 concentrations (low-CO2 = 180 μatm, mid-CO2 = 380 μatm and high-CO2 = 720 μatm), and growth temperature (26°C); only differing in the use of non-chelated hydrated and anhydrous salts as well as the YBCII EDTA concentration (i.e., 2 μM). where μm is the maximum growth rate (d−1); Fe′ is the free Fe concentration of the media (pM) and Km is the half saturation concentration (pM). Curve fitting was performed on the median growth rate for each CO2 and light treatment, using a non-linear least squares algorithm to produce curves of best fit (r2 > 0.817). Statistical analysis was performed using F-tests; analysing the variance of separate and combined CO2 curve fits by comparing a calculated F-statistic to an F-value at a 0.05 alpha level. where rPm′ is the maximum relative PSII electron transport rate (unitless); α is the initial slope of the rP-light curve (dimensionless); β is the parameter that accounts for downregulation and/or photoinhibition at supra-optimal light intensities (dimensionless); and E is the light intensity (μmol photons m−2 s−1). Overall, CO2 concentrations in the cultures at the time of sampling were between 55 and 75 μatm lower than the target pCO2 concentrations (i.e., 180, 380 and 720 μatm). This was due to drawdown of TIC associated with biomass production and was similar across all iron and light treatments (Table 1). Table 1. The growth conditions (± SE) of T. erythraeum IMS101 cultures. Growth rates decreased significantly with a decrease in Fe′ (Figures 1A,B). Acclimation to high CO2 enabled growth to occur at comparatively lower Fe′ concentrations at both low and high light (Figures 1A,B). 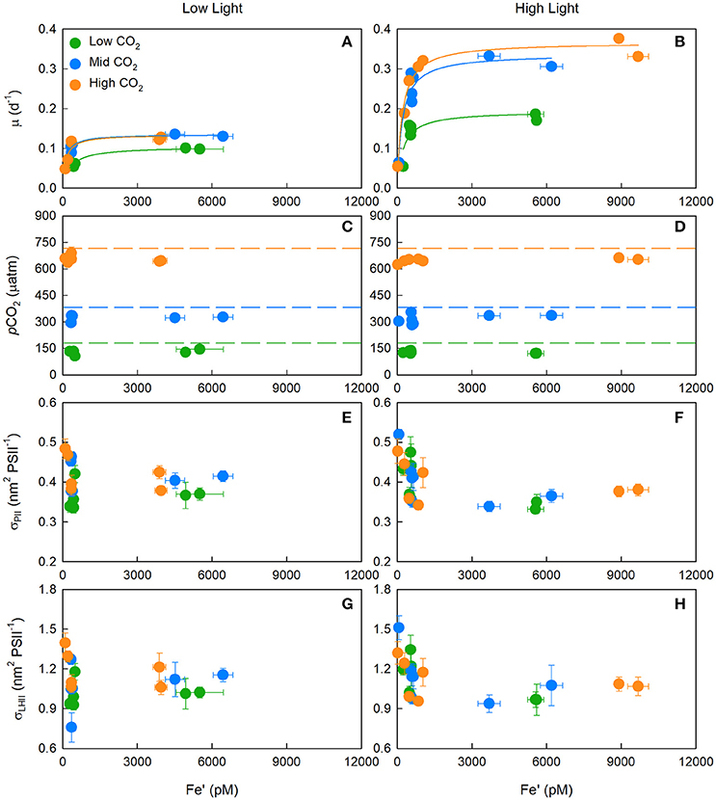 Maximum (iron-replete) growth rates (μm) exhibited a CO2 response; where at low light, μm increased significantly by 30% from low to mid CO2 [F(2, 8) = 14.00, p < 0.05], and 29% from low to high CO2 [F(2, 8) = 6.00, p < 0.05]. 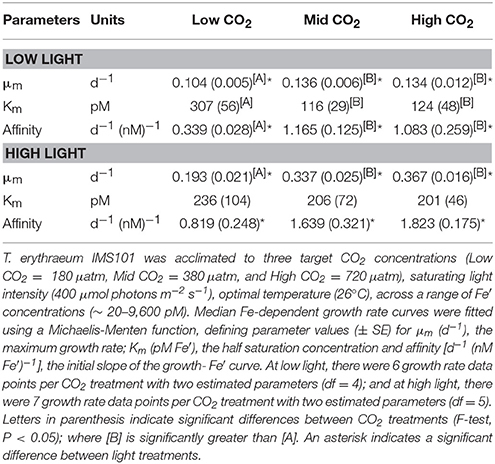 At high light, μm increased significantly by 74% from low to mid CO2 [F(2, 10) = 26.25, p < 0.05], and 90% from low to high CO2 [F(2, 10) = 51.17, p < 0.05; Table 2]. There were no significant differences in μm between mid and high CO2 treatments at low [F(2, 8) = 0.01, p > 0.05] or high light [F(2, 10) = 1.25, p > 0.05; Supplementary Table 2]. Figure 1. The median (± SE) growth rate (μ) (A,B), and mean (± SE) pCO2 (C,D), absorption cross section of PSII photochemistry (σPII) (E,F), and absorption cross section of PSII light harvesting (σLHII = σPII/Fv/Fm) (G,H) for T. erythraeum IMS101. Prior to calculating σLHII, the photochemical efficiency of PSII in the dark-acclimated state (Fv/Fm) was corrected for baseline fluorescence (Fb) by assuming Fv/Fm* = 0.362. Left-hand panels (A,C,E,G) are low light treatments while right-hand panels (B,D,F,H) are high light treatments. Cultures were acclimated to three targeted CO2 concentrations [Low = 180 μatm (green circles), Mid = 380 μatm (blue circles) and High = 720 μatm (orange circles)], two light intensities (LL = 40 μmol photons m−2 s−1, HL = 400 μmol photons m−2 s−1), across a range of Fe′ concentrations (~20–9,600 pM) and at optimal temperature (26°C). Table 2. The iron dependence of T. erythraeum IMS101 growth. At low light, increasing from low to mid CO2 caused a significant three-fold decrease in the half saturation concentration (Km) for growth [F(2, 8) = 14.979, p < 0.05], as well as a three-fold increase in the affinity (initial slope) of the growth-Fe′ curve [F(2, 8) = 11.222, p < 0.05]. Increasing from mid to high CO2 did not cause significant differences to either Km [F(2, 8) = 0.144, p > 0.05] or affinity [F(2, 8) = 1.031, p > 0.05]. At high light, the variability in Km [F(4, 15) = 0.083, p > 0.05] and affinity [F(2, 8) = 0.056, p > 0.05] between CO2 treatments was not significant. Due to the associated standard errors, there were no significance differences in Km between low and high light treatments at the low [F(4, 9) = 0.441, p > 0.05], mid [F(4, 9) = 2.049, p > 0.05] or high [F(4, 9) = 1.158, p > 0.05] CO2 treatments (Supplementary Tables 3–5). For both low [F(4, 12) = 0.333, p > 0.05] and high light [F(4, 15) = 1.429, p > 0.05] treatments, combining the mid and high CO2 growth rate data did not cause a significant difference in curve fit parametrisations. However, incorporating the low CO2 data into a combined fit (i.e., low + mid + high CO2 growth rate data) caused the combined curve fit parameterisations to be significantly different to the separate CO2 growth rate-Fe′ curves for both low [F(4, 12) = 14.143, p < 0.05] and high treatments [F(4, 12) = 27.743, p < 0.05; Supplementary Table 2]. Growth-Fe′ curves were normalised to the modelled maximum growth rate (μm) at each CO2 and light treatment to generate a single μ/μm-Fe′ curve. Low CO2 data deviated either side of the modelled curve fit (Figure 2A), highlighting that the significant differences in the growth rate-Fe′ curve fits arise from differences in the growth response to iron-limitation rather than the maximal rate achieved under iron-replete conditions. Figure 2. The iron dependency of maximum-normalised growth rates (μ/μm). Panel (A) shows the iron-limitation range (0–1,200 pM) plot on a linear scale while panel (B) shows the full range (0–12 nM) of data plot on a log scale, and includes the data points from Boatman et al. (2017). T. erythraeum IMS101 was cultured at three targeted CO2 concentrations [Low = 180 μatm (green circles), Mid = 380 μatm (blue circles) and High = 720 μatm (orange circles)], two light intensities [LL = 40 μmol photons m−2 s−1 (open circles), HL = 400 μmol photons m−2 s−1 (closed circles)], across a range of Fe′ concentrations (~20–1,010 pM), at optimal temperature (26°C). The solid line is μ/μm modelled by a Michaelis-Menten function (Km of 177 pM with an r2 of 0.803). Dark-acclimated absorption cross-sections of PSII photochemistry (σPII) showed little variation between CO2 or light treatments, but did significantly increase from ~0.4 nm2 PSII−1 under iron-replete concentrations to ~0.45 nm2 PSII−1 under iron-limited concentrations (One-Way ANOVA on Ranks, Dunn's post-hoc; p < 0.05) (Figures 1E,F). The non-baseline (Fb) corrected photochemical efficiency of PSII (Fv/Fm) exhibited a strong negative correlation to the non-Fb corrected absorption cross section of PSII light harvesting (i.e., σLHII = σPII/Fv/Fm) (r2 = −0.871, p < 0.05) (Supplementary Figure 1). The highest Fv/Fm achieved from iron-replete cultures (~0.362) was used in the calculation of Fb (i.e., Fv/Fm*). The σLHII, calculated from Fb corrected Fv/Fm values, showed no significant difference between CO2 or light treatments, but did significantly increase from ~1.0 nm2 PSII−1 under iron-replete conditions to >1.4 nm2 PSII−1 under iron-limiting concentrations (One-Way ANOVA on Ranks, Dunn's post-hoc; p < 0.05) (Figures 1G,H). The highest maximum relative PSII electron transport rates (rPm) remained relatively constant down to an Fe′ concentration of ~1,000 pM (Figure 3A), and then decreased linearly with decreasing Fe′ [t(2, 25) = 8.535, p < 0.0001 [rPm = Fe′ · 0.1455 + 100.53, r2 = 0.732]]; where rates declined by ~ 55% as concentrations decreased from ~1,000 to 20 pM Fe′ (Supplementary Figure 2). Whilst Fe′ concentrations were dissimilar between treatments, a CO2 response at low and high light was evident under iron-limited conditions; where acclimation to higher CO2 concentrations (Fe′ < 300 pM) resulted in a comparatively higher rPm, α and Ek (Figures 3A–C). For example, at the lowest Fe′ treatments, rPm was only 8% lower and 18% higher at mid and high CO2 relative to low CO2, despite Fe′ being 70 and 90% lower, respectively. Figure 3. The mean (± SE) maximum relative PSII electron transport rate (rPm) (A), photochemical efficiency of PSII in the dark-acclimated state (Fv/Fm) (B), initial slope of the rP-Fe′ curve (α) (C), slope of photoinhibition (β) (D), light-saturated parameter (Ek) (E), and light intensity at which rP was maximal (Eopt) (F) for T. erythraeum IMS101. Cultures were acclimated to three targeted CO2 concentrations [Low = 180 μatm (green circles), Mid = 380 μatm (blue circles) and High = 720 μatm (orange circles)], two light intensities [LL = 40 μmol photons m−2 s−1 (open circles), HL = 400 μmol photons m−2 s−1 (closed circles)], across a range of Fe′ concentrations (~20–9,600 pM), at optimal temperature (26°C). In (A), the dashed and solid lines are the Michaelis-Menten function curve fits for the low light and high light treatments, respectively; where green, blue and orange lines are for low, mid and high CO2 treatments, respectively. Data in the iron-limited region only (20–1,010 pM Fe′) is presented in Supplementary Figure 2. Under iron-replete conditions, CO2 did not affect the rPm (One-Way ANOVA, Tukey post-hoc; p > 0.05) or half saturation concentration for rPm (KmrPm) at low [F(3, 13) = 0.063, p > 0.05] or high light [F(3, 13) = 2.860, p > 0.05; Supplementary Tables 6, 7]. Although there was a significant difference between light treatments, where low light iron-replete cultures exhibited a rPm ~ 150 and high light cultures ~220 (unitless) (One-Way ANOVA, Tukey post-hoc; p < 0.05). There were significant positive correlations between rPm and the light-saturation parameter (Ek) (r2 = 0.797, p < 0.05), rPm and the light intensity at which rP was maximal (Eopt) (r2 = 0.501, p < 0.05), and rPm and the initial slopes of rP-Fe′ curves (α) (r2 = 0.435, p < 0.05) (Figures 3E,F). In contrast, the photoinhibition slopes (β) were not correlated to CO2, light or Fe′ concentration (r2 < 0.5, p > 0.05) (Figure 3D). The highest light-acclimated, baseline-corrected operating efficiency of PSII (Fq′/Fm′m) was not correlated to Fe′ (r2 = 0.036, p > 0.05) (Figure 3B). Although there was a significant CO2 response on the operating efficiency of PSII (Fq′/Fm′) at the highest actinic light intensity (i.e., 1400 μmol photons m−2 s−1) for low and high light cultures, where acclimation to higher CO2 concentrations under iron-limited conditions resulted in a comparatively higher Fq′/Fm′ value (Figures 3A–C). This reflects the trends reported for rPm, which is to be expected given rPm is a product of Fq′/Fm′ and actinic light intensity. Accounting for differences in growth conditions (i.e., light intensity, CO2 etc. ), iron-replete growth rates were similar to the majority of previous research, exhibiting similar responses under comparable Fe′ concentrations (Berman-Frank et al., 2001, 2007). 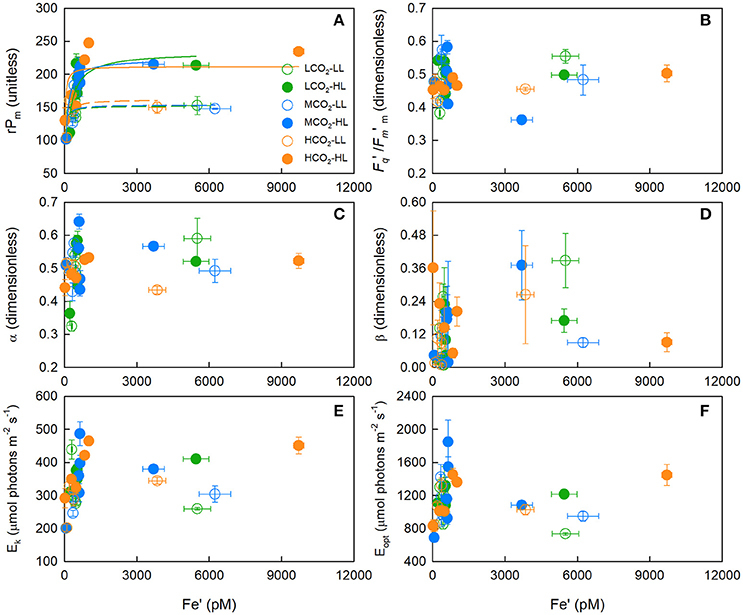 Our findings show a significant CO2 response, affirming the observation that elevated CO2 produces higher growth rates, with the magnitude of the CO2 response increasing more under iron-replete conditions. In contrast, Shi et al. (2012) reported a decrease in growth rate at elevated CO2 under iron-replete conditions, which they attribute to a direct pH-mediated change in Fe′, that in turn lowers the iron uptake rate. While we cannot offer a definitive explanation for this discrepancy, it may arise from differences in culturing techniques. Specific differences could include culture medium (YBCII vs. Gulf Stream seawater), the method used to manipulate the inorganic carbon chemistry (bubbling vs. HCl/NaOH additions) and the acclimated state of the cultures; where balanced growth is only achieved after many generations (Boatman et al., 2017). A recent study by Hong et al. (2017) reported that the positive effect of ocean acidification was due to a pH induced shift of the NH3/NH4+ equilibrium, where NH3 concentrations in the medium declines at lower pH (i.e., higher CO2). Dissolved inorganic N concentrations were measured in parallel cultures (Supplementary Table 8), and for all CO2 and light treatments were undetectable at the start of culturing and approximately 0.8 μM post-culturing. Similar concentrations have been reported in previous studies using standard YBCII media (Mulholland and Capone, 2001; Mulholland et al., 2004; Mulholland and Bernhardt, 2005), and likely indicates some cellular leakage of NH4+ from cells rather than contamination of the growth medium. In any case, the NH4+ concentrations we measured are sufficiently low (<10 μM) to have a negligible effect on nitrogenase activity and cellular metabolism (Mulholland et al., 2001), and will not be toxic to Trichodesmium cells (Hong et al., 2017). Growth rates from our highly-buffered 20 μM EDTA cultures started saturating at ~1 nM Fe′, and were comparable to the iron-replete maximum growth rates reported by Boatman et al. (2017), which used standard YBCII EDTA concentrations (2 μM). In addition, Fv/Fm of the 2 μM and 20 μM EDTA, iron-replete cultures were comparable (Supplementary Figure 1). This suggests that cultures from both experiments were not affected by trace metal toxicity, as one would expect a decrease in growth and/or Fv/Fm during exposure to toxic Cu2+ concentrations, as the primary reactions of photosynthetic will become inhibited (Cid et al., 1995; Yruela et al., 1996; Nielsen et al., 2003). Under iron-limitation there were no differences in the dark-acclimated absorption cross-sections of PSII photochemistry (σPII) or maximum photochemical efficiency of PSII (Fv/Fm) between low and high light treatments. Therefore, the lower initial slopes (Affinity) of the low light growth-Fe′ curves are likely due to a decrease in cellular chlorophyll a. Decreasing the chlorophyll a concentration conserves energy, alters the stoichiometry of iron containing components in the PET chain (Falkowski and LaRoche, 1991), and may be of importance during iron-limited, low light conditions; where a ten-fold decrease in light intensity (500 to 50 μmol photons m−2 s−1) can cause a four-fold increase in the cellular iron requirement of marine phytoplankton (Sunda and Huntsman, 1997). The combination of iron-limitation and low light conditions can significantly decrease iron uptake rates (Shi et al., 2012), creating a situation where Trichodesmium's cellular requirements for growth cannot be supported. Thus, when the light intensity is less than the Ek for Trichodesmium growth [~80 μmol photons m−2 s−1 at low CO2 and ~130 μmol photons m−2 s−1 at mid and high CO2 (Boatman et al., 2017)], productivity may well be constrained by a co-limitation of light and iron. This low light mediated response also exhibited a CO2 dependency where (i), elevated CO2 enabled growth rates to occur at significantly lower Fe′ concentrations (ii), increased CO2 yielded higher growth rates (Figure 2) and (iii), acclimation to low CO2 yielded the lowest initial slope of the growth-Fe′ response (Affinity) as well as the highest iron saturation parameter (Km). We attribute these CO2 responses directly to the operation of the CCM and the ATP spent/saved for CO2 uptake and transport at low and high CO2, respectively. At high light, Trichodesmium likely has a lowered iron quota; therefore, whilst under iron-limitation, a low CO2 concentration will limit growth rates less than low light. Based on the relative growth rate curve fits (μ/μm) and the F-test results (Supplementary Tables 2–5), we suggest that at limiting and saturating light intensities, Trichodesmium's present (i.e., mid CO2) or future (i.e., high CO2) μ-Fe′ response can be defined using shared model parameterisations. T. erythraeum IMS101 exhibited an array of responses to CO2, light and iron-limiting conditions, indicating a high degree of phenotypic plasticity. Whilst not measured here, it is well-documented that under iron-limitation, T. erythraeum IMS101 downregulates the genes that encode for major iron-binding proteins. For example, Shi et al. (2007) reported a decrease in psbA and psbE (PSII), psaA and psaC (PSI), petB and petC (Cyt b6f complex) and nifH (nitrogenase); where expression of nifH decreased significantly more than PSI or PSII genes. By contrast, Küpper et al. (2008) found that both the abundance of iron requiring PSI and the total phycobiliproteins measured from single-cell in vivo spectra remained constant under iron-limitation. The selective decrease in nifH over genes encoding for components of the photosynthetic machinery of the electron transport chain may aid in reducing the risk of photodamage and conserve energy which can be used to increase the carbon concentrating mechanism (CCM), CO2 fixation or up-regulate photoprotective (i.e., IdiA and IsiA) or iron-scavenging (i.e., TonB, ExbB, and ExbD) proteins. Proteins associated with N2 fixation are more affected under iron-limitation than those associated with photosynthesis (Paerl et al., 1994; Shi et al., 2007; Brown et al., 2008; Fu et al., 2008; Küpper et al., 2008). Decreased nitrogenase activity induced by iron-limitation (Berman-Frank et al., 2001, 2007) decreases a major sink for reductant and energy that is otherwise supplied by respiratory electron flow through the Cyt b6f complex. This complex couples PSII to PSI by transferring electrons from hydroplastoquinone (PQH2) to plastocyanin (PC) (Supplementary Figure 3). Thus, under iron-limitation, electrons originating from photosynthesis (oxidation of water) and respiration (oxidation of organic carbon) could be bottlenecked at the Cyt b6f complex, resulting in a highly reduced plastoquinone (PQ) pool and consequent decrease in non-Fb corrected Fv/Fm (Supplementary Figure 1). Alternatively, under iron-limited conditions, it may be that photoinactivated PSII reaction centres accumulate within the thylakoid membrane, which could account for the lower values for Fv/Fm. In addition, connectivity between active and photoinactivated PSIIs within a dimer or less efficient connectivity among monomeric PSIIs could account for the increase in σPII observed at very low iron concentrations (Figure 1). Additionally, non-Fb corrected Fv/Fm may also decrease in part to an increased expression of IsiA, which forms an antenna around PSI, increasing the absorption cross-sections of PSI light harvesting (σLHI) (Bibby et al., 2001a,b; Melkozernov and Blankenship, 2005; Wang et al., 2008). This mechanism may also play a critical role in non-photochemical quenching as (i), blue light converts IsiA from one form (efficient in harvesting photons) to another (converts excess energy to heat) (Cadoret et al., 2004) and (ii), high light increases the affinity of IsiA for phycobilisomes thus reducing the high fluorescence of free phycobilisomes (Joshua et al., 2005). In addition, IsiA can aggregate to form empty multimeric rings (without PSI) which exhibits a strong quenched state (Yeremenko et al., 2004), and are responsible for the dissipation of thermal energy (Ihalainen et al., 2005). Under iron-limitation, the initial slopes of the rP-light curves declined due to a decrease in Fq′/Fm′ (Supplementary Figure 4). Due to light-dependent state transitions, Fo′ can't be calculated using the initial, pre-FLC dark step measure of Fo and Fv/Fm only; and as such Fq′/Fm′ was not separated into its two contributing processes; the PSII photochemical efficiency factor (Fq′/Fv′) and the maximum efficiency of PSII photochemistry (Fv′/Fm′). The lower operating efficiency of PSII (Fq′/Fm′), and subsequent lower rP at low CO2 is likely attributed to the an up-regulated CCM and/or to a down-regulation of the IdiA protein, which is thought to maintain optimal PSII activity (Michel and Pistorius, 2004). Trichodesmium has high PSI:PSII ratios ranging between 1.3 and 4 under iron-replete diazotrophic conditions (Berman-Frank et al., 2001, 2007; Levitan et al., 2007, 2010; Brown et al., 2008). Previous studies have shown PSII to be less sensitive to iron-limitation than PSI at both an mRNA and protein level (Richier et al., 2012). It has been proposed that decreasing the PSI:PSII ratio is a physiological response to conserve iron (Berman-Frank et al., 2001), and one which could be compensated by increasing the cross-section of PSI light harvesting via IsiA-PSI super-complexes (Bibby et al., 2001a; Ryan-Keogh et al., 2012). Pseudocyclic electron transport describes the movement of electrons around PSI, and the Mehler reaction (via flavodoxin) which is a photo-catalysed reaction consuming O2 (helping prevent nitrogenase inhibition) whilst simultaneously supplying ATP to nitrogenase (Supplementary Figure 3). Mehler activity can consume up to 75% of the O2 evolved from PSII (Milligan et al., 2007). Prolonged exposure to iron-limiting concentrations could lead to the occurrence of reactive oxygen species as several key proteins (e.g., catalase, peroxidise, superoxidase dismutase) associated to the Mehler reaction are dependent on iron as a co-factor. However, as the nitrogenase pool is significantly reduced under iron-limitation, maintaining the same degree of intracellular anoxia may be less critical. As reported here, the PSII operating efficiency decreased significantly under iron-limitation, yielding lower rPm. Given that IsiA proteins can be 4 and 6 times more abundant than PSI and PSII proteins in iron-starved cultures and natural populations, respectively (Richier et al., 2012), we suggest that under iron-limitation, Trichodesmium increases pseudocyclic electron transport, with energy being re-directed from nitrogenase to enhance production of key proteins associated with iron stress (i.e., IsiA and IsiD). Our findings highlight iron as a major influencing factor on Trichodesmium growth, productivity and biogeographical distribution. Whilst iron-limitation constrains maximal Trichodesmium growth and productivity in the open ocean (Rueter, 1988; Rueter et al., 1990), integrated effects of elevated CO2 and/or high light intensities may act as negative feedbacks to climate change. Under iron-limitation the positive effects of elevated CO2 likely arise from a down-regulation of the CCM, whilst the positive effects of saturating light are likely due to a decrease in the requirement for key metalloenzymes, and lead to an increase in iron scavenging mechanisms and high light induced proteins (HLIP). Our findings are important given predictions of an increase in water stratification, a decrease in upwelling and wind-driven mixing, a shoaling of the mixed layer depth, increases in CO2 and sea surface temperatures (SSTs), as well as higher daily light exposures within the water column over the coming decades (Doney, 2006). A major source of both iron and phosphorus to the Atlantic Ocean is Aeolian dust, which provides up to 16 Tg Fe yr−1 (Jickells et al., 2005) and 1.15 Tg P yr−1 (Mahowald et al., 2008), or 82% and 83% of total input, respectively. Although toxic to picoeukaryotes and Synechococcus (Paytan et al., 2009), Aeolian dust benefits Trichodesmium by providing a source of bioavailable iron (Carpenter and Romans, 1991) coupled with a low N:P ratio. This combination of features stimulates diazotrophic growth without providing a competitive advantage to other phytoplankton groups (Krishnamurthy et al., 2010). One might expect changes in light and temperature to have a minimal direct effect on iron concentrations in the ocean. However, increased light intensity will increase Fe′ through the photolysis of ferric chelates and the resulting iron redox cycle. Temperature also influences the light requirement for algal growth, as light absorption by photosynthetic pigments and associated photochemistry within the photosynthetic reaction centres are insensitive to temperature, whereas downstream “dark” metabolic reactions which support growth are highly temperature dependent (Geider, 1987; Raven and Geider, 1988). Consequently, higher light is needed to support growth at a higher temperature (Davison, 1991). As such, increased CO2 and higher light intensities in the surface waters could help enhance Trichodesmium's productivity and growth in the future, potentially expanding its distribution into more iron-limited regions. However, it is worth considering whether the direct and indirect benefits of elevated CO2 and higher light intensity outweigh the disadvantages of supra-optimal SSTs. TB and RG: Conceptualisation. TB, MG, and RG: Methodology. TB and MG: Software. TB and RG: Validation. TB and KO: Formal analysis. TB: Investigation. TB and RG: Resources. TB: Data curation. TB: Writing (original draft preparation). TB, KO, MG, and RG: Writing (review and editing). TB: Visualisation. RG and TL: Supervision. TB: Project administration. RG and TL: Funding acquisition. TB was supported by a UK Natural Environment Research Council Ph.D. studentship (NE/J500379/1 DTB). Campbell, L., Carpenter, E., Montoya, J., Kustka, A., and Capone, D. (2005). Picoplankton community structure within and outside a Trichodesmium bloom in the southwestern Pacific Ocean. Vie et milieu 55, 185–195. Carpenter, E. J., and Capone, D. G. (eds.). (1992). “Nitrogen fixation in Trichodesmium blooms,” in Marine Pelagic Cyanobacteria: Trichodesmium and Other Diazotrophs, NATO ASI Series (Series C: Mathematical and Physical Sciences), Vol. 362 (Dordrecht: Springer), 211–217. Falkowski, P. G., and Raven, J. A. (1997). Aquatic Photosynthesis. Malden, MA: Blackwell Science. Gustafsson, J. (2012). Visual MINTEQ, Version 3.0, Compiled in Visual Basic NET2005, KTH. Department of Land and Water Resources Engineering, Stockholm. Lewis, E., and Wallace, D. (1998). CO2SYS Program. Carbon Dioxide Information Analysis Center, Oak Ridge National Laboratory Environmental Sciences Division, Oak Ridge, TN. Michaelis, L., and Menten, M. L. (1913). Die kinetik der invertinwirkung. Biochem. Z. 49:352. Oxborough, K. (2012). FastPro8 GUI and FRRf3 Systems Documentation. West Molesey: Chelsea Technologies Group Ltd.
Paerl, H. W., Prufert-Bebout, L. E., and Guo, C. (1994). Iron-stimulated N2 fixation and growth in natural and cultured populations of the planktonic marine cyanobacteria Trichodesmium spp. Appl. Environ. Microbiol. 60, 1044–1047. Rueter, J. G., Hutchins, D. A., Smith, R. W., and Unsworth, N. L. (1992). “Iron nutrition of Trichodesmium,” in Marine Pelagic Cyanobacteria: Trichodesmium and Other Diazotrophs, eds E. J. Carpenter and D. G. Capone (Dordrecht: Springer), 289–306. Sunda, W. G., Price, N. M., and Morel, F. M. M. (2005). “Trace metal ion buffers and their use in culture studies,” in Algal Culturing Techniques, ed R. A. Anderson (Elsevier Academic Press), 35–64. Copyright © 2018 Boatman, Oxborough, Gledhill, Lawson and Geider. This is an open-access article distributed under the terms of the Creative Commons Attribution License (CC BY). The use, distribution or reproduction in other forums is permitted, provided the original author(s) and the copyright owner are credited and that the original publication in this journal is cited, in accordance with accepted academic practice. No use, distribution or reproduction is permitted which does not comply with these terms.